From the towering Table Mountain that dominates the skyline of modern and vibrant Cape Town to the wild swaths of land home to lions and elephants in Addo Elephant National Park, South Africa, located at the very southern tip of the African continent, contains a huge variety of activities for travelers of all interests. The hop on, hop off tram in Franschhoek will take guests to some of the most acclaimed vineyards in the region, and the Cradle of Humankind offers a glimpse at the fossils of some of humanity’s ancestors, which are millions of years old. South Africa’s climate is pleasant, and the country is home to beaches, mountains, grasslands, and exciting cities that reflect the centuries of blended culture from all the societies and settlers who founded them. Kruger National Park is one of the largest natural reserves in Africa with more than 7,500 square miles of mountains, tropical forests, and grassy plains. 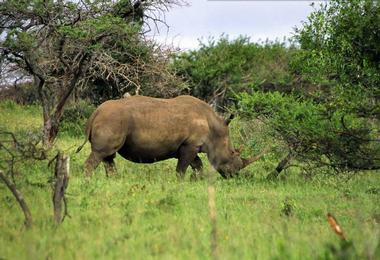 The park features an impressively high population of wildlife, from a diversity of plants to the “Big Five” of African animals: elephants, lions, rhinos, buffalo, and leopards. The park is also home to hundreds of other species of animals, birds, and plants, and guests to Kruger National Park can witness some of this astounding nature up close by taking a classic safari tour through the area. Kruger National Park offers day safaris as well as overnight trips, and you can choose from a variety of accommodations, from a rustic camp setting to a luxury private safari lodge. Addo Elephant National Park is a massive wildlife conservation space located near Port Elizabeth at the southeastern edge of South Africa. The park is home to lions, hyenas, black rhino, and of course, elephants, all of which live wild within the park’s borders. Visitors can drive, hike, ride horses, or take a jeep tour through the park, where they will see birds and animals at the watering hole, grazing in the savannah, or roaming their natural habitat. There are also many camps and areas of the park that are accessible to wheelchair users and disabled guests, where they can also spot birds and many other types of wildlife. Visitors can also choose to camp at the park or stay in one of the lodges on the premises. Cape Town is the capital of South Africa, located on a peninsula on the country’s southwest coast. It’s an incredibly vibrant city with a colorful and varied mix of cultures, as well as an abundance of outdoor activities both on land and in the water. Visitors to Cape Town can take a cable car ride up to the top of Table Mountain, which towers over the city, and from there they can see stunning views of the city, the surrounding land, and the deep blue of the South Atlantic Ocean. Visitors can also take a boat from Cape Town to Robben Island, where they will find the infamous prison that once held Nelson Mandela during apartheid. The prison is now a museum where guests can learn about the island’s history. Just about 30 miles northwest of Johannesburg is the Cradle of Humankind, a UNESCO World Heritage Site that contains millions of years worth of fossils. 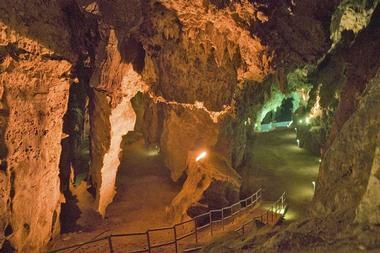 There are fifteen major sites in the Cradle of Humankind, such as the Sterkfontein Caves, which are filled with fossils and evidence of early prehistoric life. One of particular note is Little Foot, the fossilized skeleton of an Australopithecus (ancient species of hominid) that is estimated to be more than 3 million years old. These fossils and many more are still being excavated, and they present a stunningly educational look at human history, and all the species who came before us. 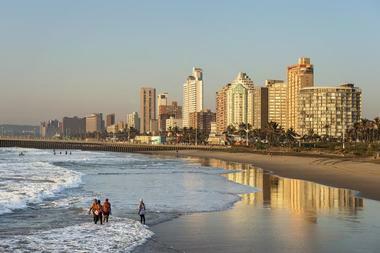 Durban is a coastal city in eastern South Africa with a very noticeable mix of cultures like Indian, traditional African, and colonial European. A seafront promenade in Durban provides some lovely golden beaches for sunbathing and swimming as well as a beautiful view of the ocean. Guests in Durban can ride horses along the beach or delve beneath the waters with Scuba diving or even in a shark cage. On land, visitors will also enjoy the many shops in the city, as well as the abundance of craft fairs, markets, and bazaars that fill the streets with color, music, and activity. On Wilson’s Wharf, a trendy seaside district, there are plenty of options for food, shopping, and fun. Many festivals are hosted there throughout the year. 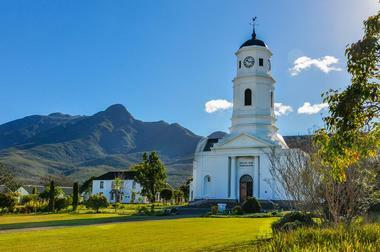 The town of Franschhoek in southwestern South Africa just north of Cape Town is a beautiful historic town that bears a lot of evidence of the French colonists who settled there in the 17th century. 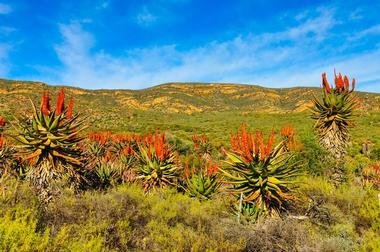 Visitors can explore Mont Rochelle Nature Reserve for a peaceful hike to look at some of the natural landscapes and wildflowers of the region or check out the Huguenot Memorial Museum to learn about the French settlers who came to the region centuries ago. The Francshhoek region is also incredibly well known for its wine, and visitors will particularly enjoy the Franschhoek Wine Tram, a double decker open air tram that travels between vineyards in the region. George is a coastal city in West Cape, South Africa that is part of a region known as the Garden Route, named for the Cape Wildflower Floral Kingdom. It is home to many sunny and peaceful golf courses as well as Wilderness, a national park that is a haven for hikers, nature lovers, and seekers of adventure. 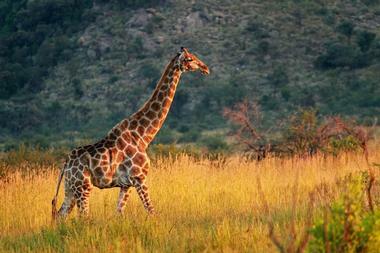 In Wilderness National Park, visitors can enjoy beaches, hiking trails, gorges, lakes, and wooded hills. In the city itself, you can can find the Outeniqua Transport Museum, which contains displays and exhibits about historic steam trains and vintage cars, as well as the George Museum, where you can learn about the history of the region, including its timber industry. 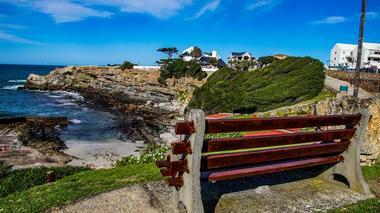 Hermanus is a coastal town in West Cape that is extremely famous for the whale watching opportunities there in the southern winter and spring months of June to November. During this time, huge pods of whales migrate north from Antarctica, and many tours are available for tourists to try and catch a glimpse of these amazing creatures as they travel, mate, and explore the waters with their newly calved young. Hermanus truly has some of the best whale watching in the world, and visitors would be remiss if they didn’t hop on a boat, a helicopter, or a high cliff path to try and see them. The area is also a great place to look for sharks, as about 5 miles from the coast there is an area called Shark Alley that is a very popular hunting ground for great white sharks. 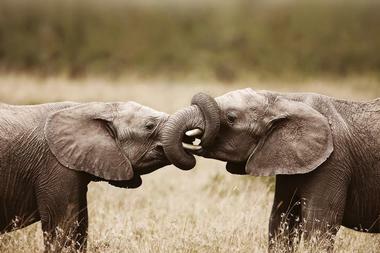 Established in 1895, Hluhluwe-Imfolozi Park is the oldest game reserve in all of the continent of Africa. It consists of almost 400 square miles of rolling hills and green grassland, and it is home to an abundance of wildlife such as zebra, rhino, elephants, lions, hyenas, and many species of birds. Visitors to Hluhluwe-Imfolozi Park can take a safari ride in an open air safari vehicle, which will drive through the very heart of the park to places where the animals spend their days, and guests are often surprised by elephants crossing the road directly in front of them or a herd of antelope on the move. 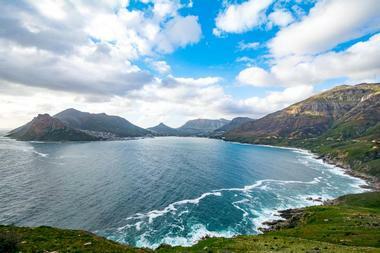 Hout Bay, a peninsular town located just south of the capital city of Cape Town, is a lovely little seaside area that is close enough to the big city for day trips and exploration in the metropolitan area, but far enough away that it is much quieter and peaceful. The village is surrounded by water and mountains, its coasts lined with sandy beaches, and there is pleasant weather in abundance. 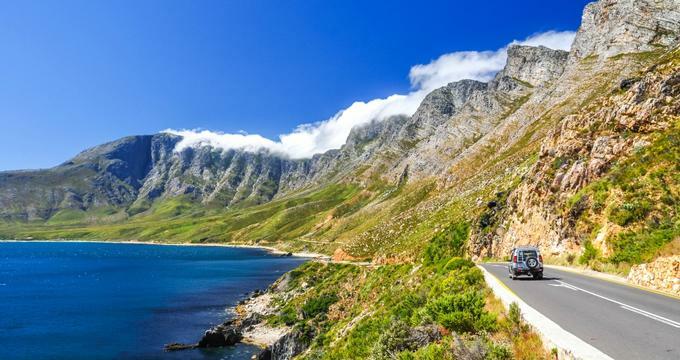 Visitors to Hout Bay can take a drive on Chapmans Peak Drive, a scenic road that leads through the mountains and will eventually find its way to Cape of Good Hope National Park, a rocky area at the very southern tip of the peninsula. Located in Eastern Cape, South Africa, Jeffreys Bay is an international destination for surfing enthusiasts thanks to the amazing right hand surf breaks in the surrounding waters. Surfers have helped to turn Jeffreys Bay into a year round destination, and their presence has also made it a haven for local craft vendors and delicious food and drink. 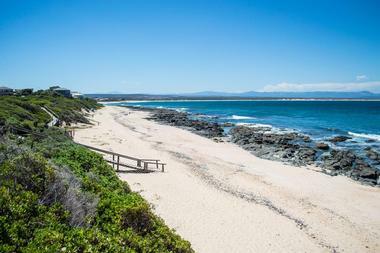 The waters of Jeffreys Bay are also home to dolphins, great reefs for snorkeling and scuba diving, and plenty of sunshine –visitors will enjoy the relaxed atmosphere of the town and everyone in it. Adventure tourism companies offer adrenaline pumping activities like zip lining and massive waterslides, and in the evenings, visitors will enjoy being able to rest their heads at any of the town’s great and varied accommodation options. 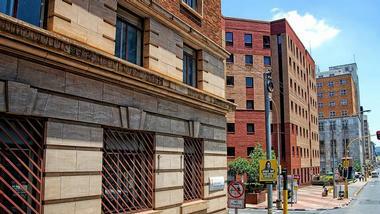 When Johannesburg – or as it’s known by locals, Joburg or Jozi – was first founded in the 19th century. At the time, it was a small gold mining town, but today it is one of the largest cities in the country. 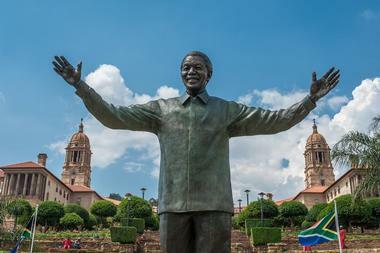 This historic city was once home to notable figures such as Desmond Tutu and Nelson Mandela, whose former home is now the location of the Mandela House Museum. This diverse city has many attractions, including the African Flea Market, the Soweto Theatre, and Croc City Crocodile and Reptile Park. The city is also home to the Apartheid Museum, which chronicles the history of segregation in South Africa, and Constitution Hill, which was once a prison complex. 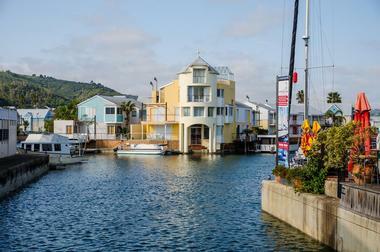 Of all the towns located on the Garden Route, Knysna (pronounced ny-sna) might be the most famous. A town whose history lies in the timber industry, Knysna is home to some lovely shops and galleries that sell locally sourced and made wooden furniture, jewelry, and crafts. Unfortunately, due to a massive wildfire in 2017, much of the beautiful forests and nature surrounding Knysna were destroyed. It’s a tragedy that will take the community decades to recover from, and the surrounding forests may never be quite the same again, but the hardy town of Knysna carries on with life, providing tourists with an artsy, friendly, and progressive community for the duration of their stay. 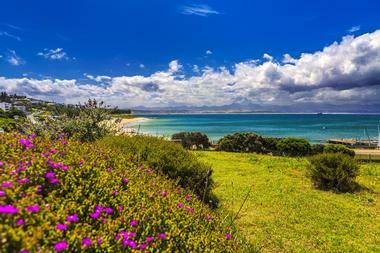 Mossel Bay is a seaside town on the Garden Route in West Cape. Home to Santos Beach, a wide, sandy stretch of coast where visitors can spend the day relaxing or participating in water sports, this beautiful harbor town has a relaxed friendly atmosphere and is quite a popular vacation spot. Visitors can explore the Cape St. Blaize Lighthouse, a 19th century structure that offers lovely views out into the bay or explore some of the museums in the town like the Maritime Museum, the Shell Museum, the botanical gardens, or the Shark Lab mini aquarium. Mossel Bay is also home to the unique and beautiful Post Office Tree, a milkwood tree that is over 500 years old and was first used in 1500 as a repository for letters. Oudtshoorn, a town within the Western Cape region of South Africa, is most well known for its abundance of ostrich farms. This town, which is fondly known as the ostrich capital of the world, is home to many farms like Cango Ostrich Farm, where visitors can meet and see the world’s largest bird up close and personal, as well as the CP Nell Museum, which has exhibits relating to the ostrich feather industry that made the town what it is today. Oudtshoorn is also home to the Cango Caves, a beautiful and dramatic cave network where visitors can take tours through the stalactites and other mineral formations. Pilanesberg Game Reserve is located just northwest of the city of Johannesburg, and it is set apart from other wildlife areas in South Africa because Pilanesberg is situated in the crater of an extinct volcano, an environment that has since given birth to grasslands, incredibly rock formations, and stunning valleys full of forests. 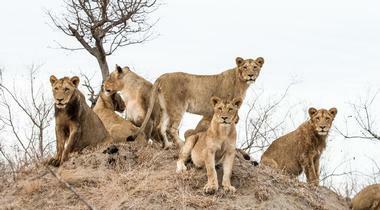 Visitors to Pilanesberg Game Reserve can drive themselves or take a guided drive through over 120 miles of scenic roads that wind through some very populated areas, including Mankwe Dam, a manmade watering hole that animals flock to on a daily basis. Pilanesberg is home to the Big Five of Africa (elephants, lions, rhinos, buffalo, and leopards) as well as many other species of animals, including over three hundred species of birds. 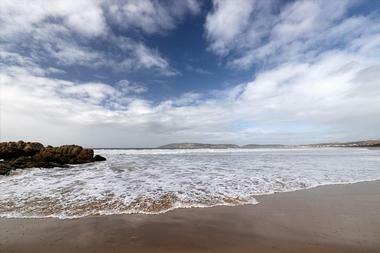 The seaside town of Plettenberg Bay, or Plett as it’s called by the locals, is on the southern coast in the province of West Cape. Along the edge of the ocean, there are several wide, sandy beaches including Central Beach and Lookout Beach, both of which are well known for their surf breaks and are quite popular with both experienced and amateur surfers. 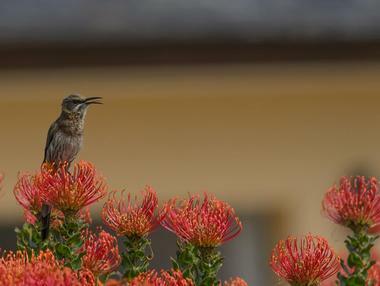 Visitors to Plettenberg Bay can check out Birds of Eden, a large bird sanctuary that houses over two hundred species of birds and is the largest sanctuary of its kind in the world. Alternatively, you can visit one of the sixteen wineries in Plett for a taste of the local vintages. 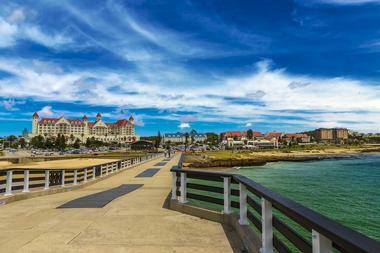 Port Elizabeth is a major port city located in East Cape, with many sandy beaches along its coast. Visitors will enjoy exploring the city for a taste of the Victorian architecture in its oldest districts such as Old Hill. You can also take a boat tour to spot whales and seabirds on the water. 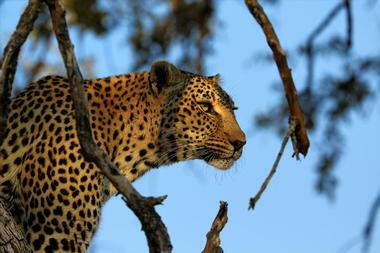 There is also ample opportunity to spot wildlife in Kragga Kamma Game Park, a nature preserve where visitors can see native wildlife such as elephants and rhinos on the driveable safari trails and even have an in person encounter with a cheetah. Pretoria is located just north of Johannesburg in the Gauteng Province of South Africa, and it is the administrative capital of the country. The city is rife with beautiful jacaranda trees, which bear entire canopies of purple flowers and have earned Pretoria the nickname “Jacaranda City.” Pretoria, a major city, is home to a lot of cultural monuments celebrating South African history, such as the Voortrekker Monument, which honors Afrikaans settlers, and the Union Buildings, where Nelson Mandela was inaugurated and which now are home to the South African president’s offices. Botanical gardens, nature reserves, zoos, and of course, the prevalence of the beautiful jacaranda tree all help to give a touch of nature to this modern city. Sabi Sabi Game Reserve is a private natural reserve that offers some of the most luxurious safari experiences in all of South Africa. The lodges at Sabi Sabi are themed “yesterday, today, and tomorrow,” but each of the three option bears with it an unmistakable touch of elegance fit for royalty. The incredibly friendly people at Sabi Sabi work tirelessly to make sure that each guest has an unforgettable experience as they relax in their suite, enjoy delicious food, and head out into the wilderness on a safari ride that will show them the wonders of the African wild, including animals like elephants, lions, and more. On the eastern edge of the Cape Peninsula and less than an hour’s drive from Cape Town is Simon’s Town, a coastal village that is the proud home of the South African Navy. 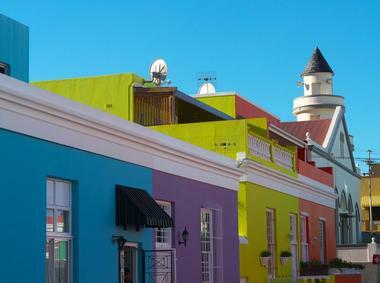 Visitors to Simon’s Town will find beautiful, colorful architecture surrounded by the rocky slopes of mountains. Nearby are the blue waters of the Atlantic Ocean and all the occupants of it, like whales, penguins, and a diverse number of birds. For a taste of local history and culture, you can visit the South African Naval Museum, the Toy Museum, or Simon’s Town Museum, and for some exploration in nature, there’s the stunning beauty of Table Mountain National Park. St. Lucia is a charming small town in South Africa’s province of KwaZulu-Natal, which serves mainly as a gateway for the Greater St. Lucia Wetlands Park. This beautiful wetland is a UNESCO World Heritage Site, and visitors can take a safari to see some of the animals who call the area home, most notably the hippopotamus. In fact, hippos have very nearly taken over St. Lucia, and it’s not uncommon to see them in and around town, crossing streets, taking over swimming pools, and stopping traffic. 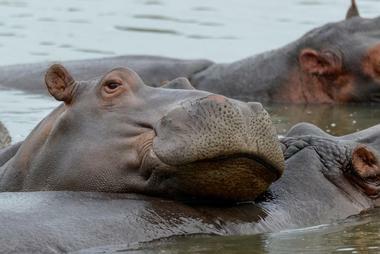 Visitors should note, however, that hippos are incredibly dangerous animals and although the ones in St. Lucia are more accustomed to humans than most, they are not to be approached. 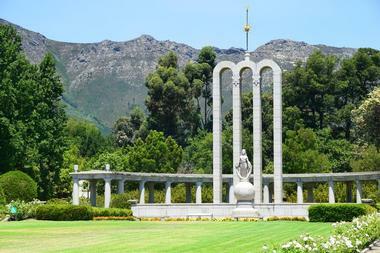 Stellenbosch is a town best known for being the home of Stellenbosch University, and this thriving college town bears with it all of the diversity and culture typical of university atmospheres. 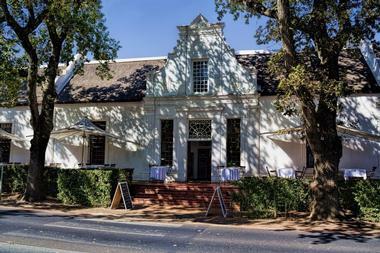 Located deep in the wineland country of South Africa and surrounded by mountains, Stellenbosch is a beautiful town with a lot to offer its visitors. Jonkershoek Nature Reserve has lovely hiking trails in a mountainous setting, and Assegaaibosch Nature Reserve is a massive historic estate with beautiful trails for wandering and picnics. You can also tour the Village Museum complex, which contains four historic houses with their original furnishings, or wander the town’s shady streets to browse shops, frequent galleries, and try some local food. The iconic Table Mountain, with its flat top, is the mascot for this massive and beautiful park, which stretches from north of Cape Town all the way down the Cape Peninsula to the Cape of Good Hope. There is a cable car that takes visitors to the top of Table Mountain, where they will find beautiful views of Cape Town, the coast, and more. The park is one of the richest and most diverse floral regions in the world, and those traveling in the spring or summer will be rewarded with gorgeous, colorful views of abundant plant life. 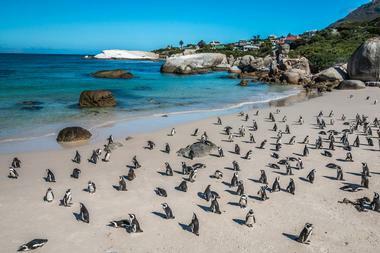 Wildlife in the park is diverse, and at Boulders Beach near Simon’s Town, you can even see penguins who made the migration all the way from Antarctica. Tsitsikamma National Park is a lush natural landscape part of the larger Garden Route National Park on the southern coast of Africa near Plettenberg Bay. Tsitsikamma is home to deep gorges carved from the earth, including Bloukrans Bridge, which is famous for bungee jumping and also features rivers, waterfalls, and some lovely vegetation. 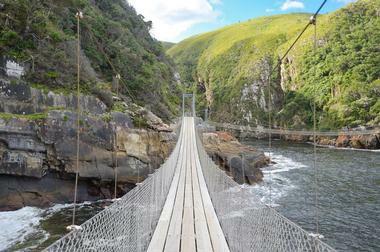 Tsitsikamma also includes a marine reserve. Visitors to Tsitsikamma National Park can explore its many gorgeous trails by foot, by horseback, or even by kayak, and if they are lucky, they will spot one of the many species of bird which live in the park or even one of the wild bush pigs that are native to the area.